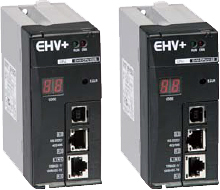 The EHV+ Series is a fully IEC61131-3 compliant PLC Series which offers effective programming features and reduced debugging and commissioning time. 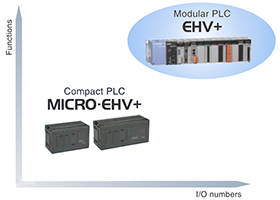 The powerful hardware performances of existing EHV Series are succeeded to EHV+, such as multi-programming port (USB, Ethernet, Serial), compatibility of I/O modules for EH-150 Series, high reliability, superior in quality and much more. Integrated Development Environment (IDE) "HX-CODESYS"
HX-CODESYS is a professional development tool based on CODESYS V3.5 by 3S. ■ Standardized programming style with 5 programming languages (LD, FBD, IL, ST, SFC). ■ No need to study manufacturer’ s specific programming way. 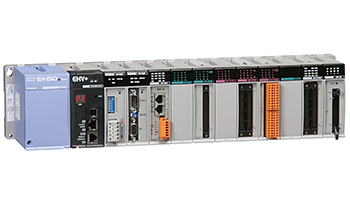 ■ Same Variable names are shared by PLC, HMI, SCADA, and other I/O devices. ■ Offline simulation function on programming software.